Outside of Ștefan cel Mare the vast majority of all famous Moldovans are writers and poets, and when you keep in mind how much pride Moldovans take in their language this makes a lot of sense. In the same way that there is street named after Ștefan there is probably a school named after Mihai Eminescu in at least every other village. 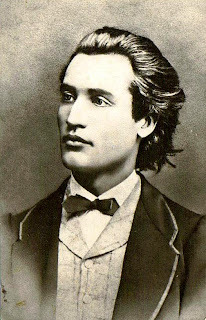 Mihai Eminescu with his striking good looks is another figure who finds his way to be memorialised throughout the country of Moldova. Born in what is now the Republic of Moldova he spent much of his life actually living in present day Romania, namely the cities of Iași and București. Although he was very much a wanderer never spending too much time in one place he died at the premature age of 39. But before he died he left behind volumes of poems and other literary works. I'll give you a sample of one of his poems...well actually a sonnet since his poems tend to run long. And mystery its meaning half unveil. O secret twilight hour on evening's shore. My hand upon the silent lyre is numb. While time rolls out behind me... night has come.